February is the month of pink and reds hearts and cupid’s bow. Many cultures have their stories of love and loss from Cleopatra and Mark Anthony to Romeo and Juliet. Hawaiians also have their story about forbidden love. There were two young lovers. One was a princess name Naupaka, a high-born girl from an Ali’i, royal, family line. The young man, Kaui, was a commoner. They fell in love, as boys and girls do, and they desired more than anything to be married. So they climbed the mountain to see the kahuna, priest. They travelled to the heiau, temple, to ask for the blessing of the priest. Sadly, the kahuna told them he could see no clear path for them to be lovers under the Laws of the Kapu system. He advised them to pray for an answer. As they prayed, it began to rain. When she realized there would be no solution and they would be torn apart, Naupaka took the flower from her hair and ripped it in two. She gave one half to Kaui. She kept one half for herself. When they were discovered, the lovers were banished. He to the uplands. She to the shoreline. The naupaka bush growing nearby who had witnessed the young couple’s sadness, began to grow but only in half-bloom. The spirits of the boy and the girl were held within the plant and the flower is called Naupaka. The female flower is called Naupaka Kahakai, of the ocean. The shrub grows along the shoreline as safe haven for nesting sea turtles. It’s leaves are round, silvery and smooth. It has some tiny white berries that look like an eyeball. When we squeeze the berries, like tears, they shed their clear liquid medicine. We use them to make medicine for the eyes. But this flower is only half of the legacy of these forbidden lovers. 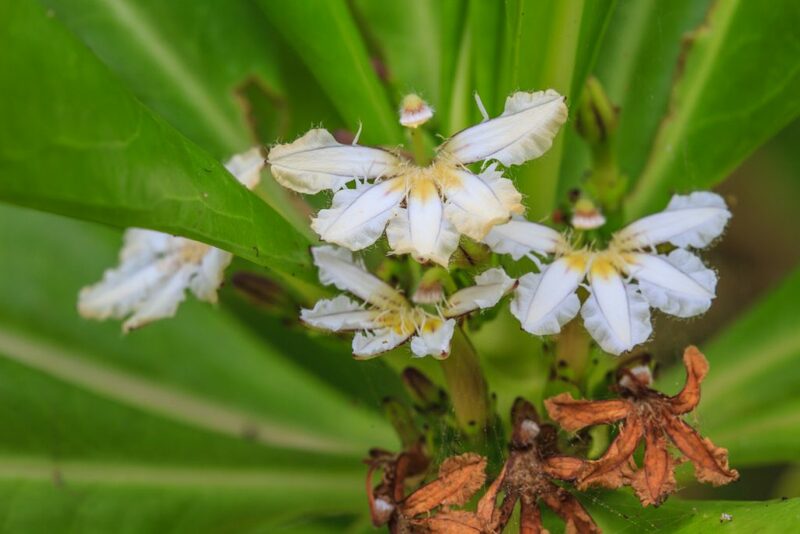 In the slopes of the upland forest you will find the Naupaka Kuahiwi. It’s leaves are more spiky and it’s skin more coarse. It’s fruits have been used traditionally to create a purplish black dye for Kapa – bark cloth. This is the male plant. 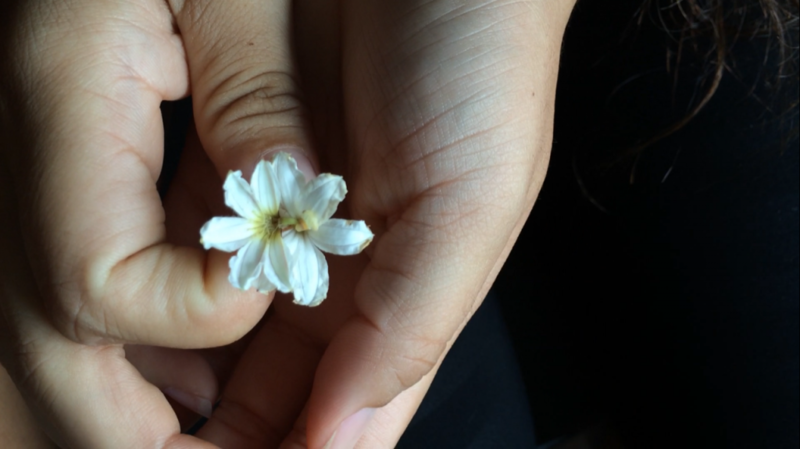 Surprisingly, if you take the naupaka flower from the mountain and you put it with the flower from the ocean it makes a full and complete circle of petals. This is a story about forbidden love and yet the lovers still are guardians of one another from the mountain to the sea. Love is eternal because our spirits are eternal. I know for some, Valentine’s Day can be difficult if you don’t have a special someone. But, I do think that there is someone special out there for everyone. Possibly MANY someones special, because our spirits go through many life times to learn what we need to learn from each other. Love doesn’t have to end when we part. There are still many opportunities awaiting those of us that are yearning for a loving partner. For these young lovers, the magic was of love and prayer. I remember 12 years ago when I sent out a prayerful intention to the universe to send me my CHIEF. I imagined the man that I wanted to stand beside me and all the qualities that he would possess. To me, a chief meant someone who is spiritually connected. Someone who realizes that their thoughts and actions affect their whole community. A man who is disciplined, enjoying both work and play. A chief is committed to loving, protecting and supporting their family. He does not see himself above others but is willing to work beside, support, and care for his community with humility and without hierarchy. I recited this list of qualities to a friend while at a Hale Pulo’u lo’u, Hawaiian Sweat Lodge ceremony. I was facilitating this ceremony in a dim lodge barely lit by red hot lava rocks. This was my magical prayer for love. What I didn’t realize…the whole time we were in the lodge singing chants and lifting up prayers, was that my perfect, “forever guy” was standing right behind me eaves dropping! He was sitting in the darkness sending me what we now call P-MAIL. Psychic mail right to my third eye! All I had to do was open my eyes and see that he was the CHIEF that I had been waiting for. I am happy to say that I got the message and my husband Justin and I have been serving our community and family side by side ever since. Don’t be afraid to spell it out to the universe in prayer of exactly what you want. WE ALL deserve the sacred gift to love and be loved in return in this life and the next. PS: I have a few spaces in the Advanced Lomi Lomi Spring retreat coming up in April. I would love to see you in Maui! !